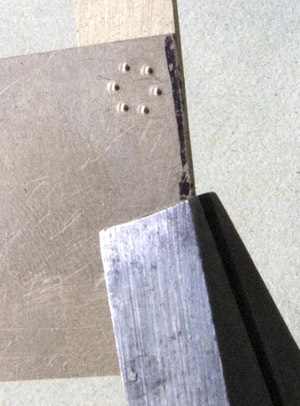 On the ashpan there are hinges with circular plates and six equispaced rivets. 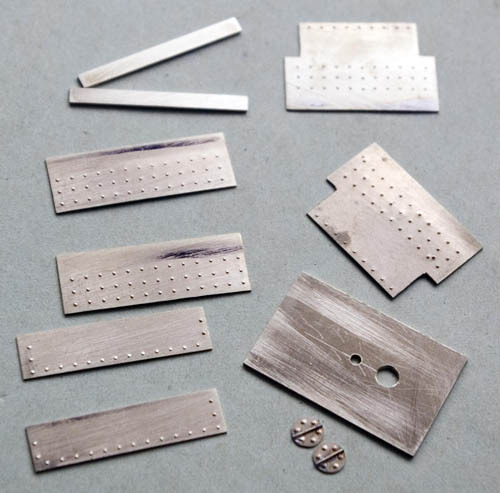 To simulate the rivets, I cut a template with six small holes in the correct pattern using the mill with a drilling attachment and rotary table. 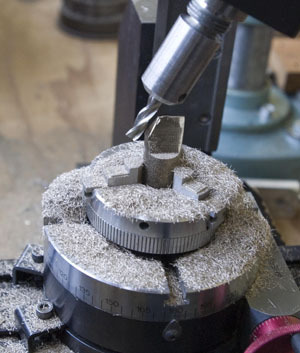 In my rivet punching tool I have a punch with a reduced diameter tip that is a nice sliding fit in the holes. By clamping the template to a piece of thin material, I was able to make the six indentions. 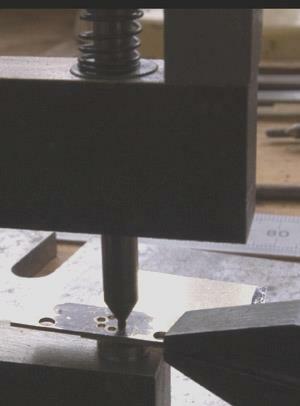 Using the same technique, it is possible to make just about any pattern of rivets with a simple rivetting tool. 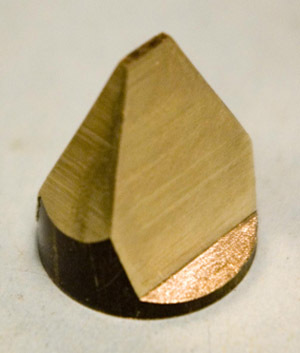 This pyramidal shaped piece (photographed here upside down) goes under the smokebox. I guess it is an ash collector, but I'm not sure. It was milled from a round bar held in the rotary table, then parted off leaving enough base for attaching to a frame spacer. I found it is possible to cut and file the circular shape by eye, using the circle of rivets as a guide. The hinge itself was represented with thin wire soldered across the middle. The finished hinges are in the photo below, along with other parts of the lower firebox and ashpan.